I’ll admit it: I’m not good with titles. I spent four years of college studying English, and another six editing books, and I never managed to acquire a knack for naming. When my authors used to consult me about potential book titles, a lump formed in my throat: heck if I knew. Coming up with clever titles—for books, essays, or even emails—is an art, and I’m not that kind of artist. Thankfully, M happens to be the more creative in our partnership. And so on Saturday, while we were pondering a name for the incredible and nutritious new soup I’d made, he suggested the gently amusing “wall of green.” It couldn’t have been more apt, because this soup, which contains green split peas and no less than five heaping cups of green leafy vegetables, brings a new level of texture, taste, and harmony to your standard blended green food. It’s delicious, and if you gave me a choice of this soup, a green smoothie, a green juice, or even my standard blended salad, this would win in an instant. Appropriately, the idea for this soup was also M’s. Thanks to my weekly grocery run and his grocery box, we had about five pounds of bok choy, lettuce, kale, and spinach in my fridge. I knew it would be tough to finish them before the weekend ended, and so did he, which is why blending the greens seemed so smart. 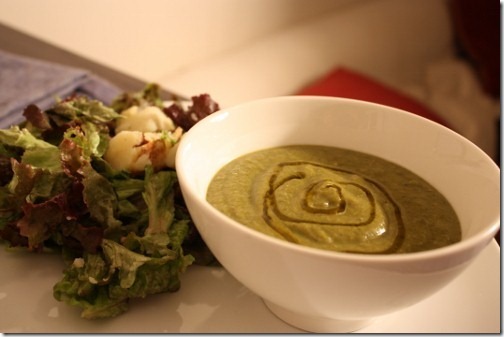 At first, I wasn’t sure how I’d pull off a soup that was delicious, but also incorporated so many leafy greens. After a little brainstorming and some inspiration in the form of this recipe from my friend Susan, I came up with the following. Using my pressure cooker made it super quick and easy, but you could absolutely cook it the regular way, too; I’ll give you both instructions below. In the end, you should have a thick, creamy, piping hot pot of soup that’ll help you to max out on your leafy green intake for the day without even the slightest of grimaces. 1) Place the potatoes, shallots, carrots, celery, split peas, and broth in a pressure cooker and bring to pressure. Cook on high pressure for 8-10 minutes; then release pressure (manually or by letting the pressure come down on its own). Alternately, bring the ingredients to a boil and then simmer for about 35-45 minutes, or until split peas are very tender. 2) Blend all ingredients with an immersion blender or pour it into a regular blender and do it that way, till it’s well pureed. 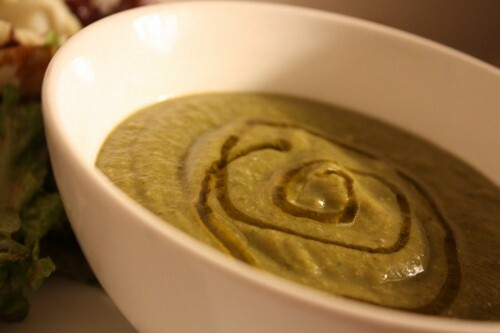 3) Add greens and mushrooms to the blended soup, cover, and bring to a gentle simmer. Let it simmer for 25 minutes or so. 4) Add the parsley, lemon, nut or coconut butter, almond milk, and nutritional yeast. 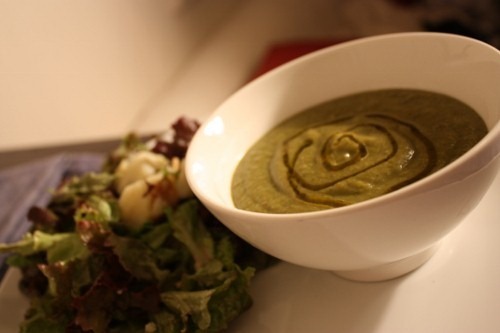 Using an immersion blender or a regular blender, blend the soup a second time. 5) Warm the soup over a gentle flame once more, and season to taste with salt and black pepper. 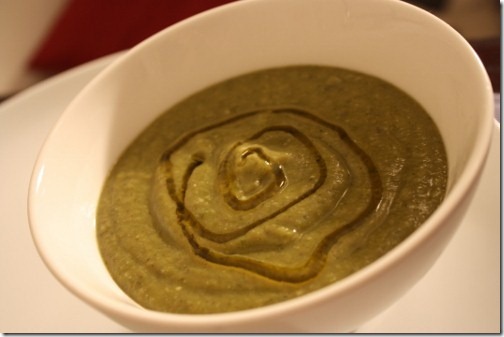 Note that you can use any combo of greens in this soup. I used bok choy, spinach, and kale, but broccoli, chard, and even zucchini would be great, too. As you can see, I served ours with a nice drizzle of flax oil. On the side we had sprouted grain buns and a lovely salad of lettuce, warm russet potatoes, button mushrooms, olive oil, lemon, a touch of agave, salt, and pepper. It was a hearty and tasty and healthy dinner. Over dinner, the topic turned momentarily to protein, and how easy it is for vegans to adequately meet their protein needs. I realized that this dinner was in fact a perfect example of that fact: split between three, it delivers almost 20 (yes, 20!) grams of protein (split peas, nutritional yeast, potatoes, and leafy greens go a LONG way). Split between four people, it delivers about 14.75 grams. And of course, this is to say nothing of how incredibly nutrient dense the soup is otherwise: it’s bursting with vitamins A and K, folate, magnesium, iron, a full spectrum of B vitamins (including B-12), and healthy fats. It’s one of the most nourishing meals I can think of, and for that reason I think it’s destined to become a student favorite of mine. 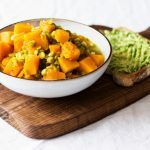 Now more than ever, I need optimal plant fuel that demands little time and work; this soup, which is easy to transport and makes great leftovers, fits the bill perfectly. And if I had to be honest, I’d say it’s a little more palatable than blended salad. What’s your favorite nutrient dense meal? What does it provide, and why do you love it? my favorite nutrient-dense meal involves a sweet potato, a ton of veggies, and some form of protein. always filling and satisfying, with a little bid of sweet – something most of us crave at any time of day. Looks great! I love the drizzle on top. Hope midterms go well for you! Don’t worry I always like your titles! Simple & smart. Witty naming is definitely the gift of a talented few – but as long as it’s tasty, I wouldn’t care what it was called! This definitely looks amazing, and something great for those of us (ahem) who may be wrestling with our tastebuds on the raw soup front. Thanks for another wonderful recipe! 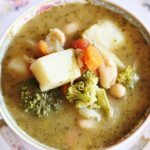 I love how this soup has so much protein (and nutrients!). Awesome. I love the swirl of oil over the top… makes it look so professional! Wall of Green…great name! And using both regular groc store greens AND farm/CSA box of greens..that is one reason why i only get my CSA every other week, otherwise I can never use everything up in one week. I always feel like i am scrambling and something goes to waste so every other gives me more cushion. I hate to waste! I love the flax swirl, too. Sooo pretty! And my fave nutrient dense meal? Does a cup of coffee and some chocolate count? Just lots of green veggies, edamame, homemade dressing, maybe some tofu, nooch sprinkled…super basic but I eat that combo, daily. So if I don’t want to buy veggie broth or bullion whats a good sub to go with water? Just season how I want? Love the name and this soup looks wonderful! And such pretty pics with the flax oil drizzle, very creative! I’m the same way with titles, I lack talent there. My favorite nutrient dense meal is a green-heavy raw soup or a monster salad with a veggie-based dressing. So I’ve gotta try this soup! love that you are posting green on a day filled with chocolate and red stuff. i started my day with a big glass of green juice. i’d say it’s one of the ways I get a lot of nutrients but it’s not a full meal for me. I guess I like a big salad or smoothie for a nutrient dense meal. Or salad with beans or bean soup on the side. thanks for the recipe! That soup sounds perfect. You’re so right on, too, about how easy it is to get adequate protein (I’m just listening to Colin Campbell now, wrapping up the Great Health Debate). I have to say, for a nutrient-dense meal I love a good smoothie with lots of greens in it but also some fruit, and spirulina/chlorella, maca, plenty of coconut…Keeps me humming! SOOOOOUUP:) Gena I love all of your recipes!! Keep posting new ones, especially raw ones, they are my favorite! I with you on the titles, I’m always dumbfounded when it comes to naming anything! The biggest, greenest salad I can imagine tossed back with a green juice with lots of ginger always makes me happy. This recipe looks wonderful! 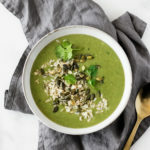 I’m always looking for a good soup to stock my freezer with and this looks like an awesome green alternative to a raw soup/blended salad which I’ve sadly never been a fan of..
hi Gena! this recipe looks fabulous but what could I substitute for nutritional yeast? Im afraid to try it bc I heard that it upsets peoples stomachs and mine is quite sensitive. could I use maybe texturized vegetable protein? thanks! I hate to break it to you, but I think that TVP is far more likely to hurt your stomach than nooch! I speak only from experience, but I do have a feckless digestive tract, and nooch is perfectly fine for me. Blended soups are a mainstay here! I find them a miraculous way to pack veggies but feel like I’m eating gravy! I really go through phases though… no blended soups in a while- the past two weeks it’s been a lot of bean-veggie-nooch-avocado stir fries with Mexican seasoning and vegannaise (shrug)! I’ve never seen a blended green soup (besides plain split pea obviously) which isn’t raw, but I like the idea a lot. Despite being a big fan of raw foods, I often have trouble stomaching raw soups. I must try this. Your soup looks and sounds amazing. I will be trying an amended version of this when I return from a trip to New York City this Thursday to next Wednesday. I have halted my CSA box for this week so I am experiencing an unusual dearth of produce. Purple-topped turnips linger on the fridge shelf and my last bouquet of chard is in the crisper. I suppose I will be buying daily from the farmers markets until I leave on Thursday morning. I almost feel the need to load up and get my fill as I’m pretty sure I will be living on Larabars during my trip days to save some (paper) green. I’m staying with my best friend from childhood in Brooklyn and so we’ll probably hit up a few vegan spots as I stay over there. But a few trips to the city might necessitate splurges at Manhattan locales. On nutrient dense meals: salads are my favorite. I have been doing a lot of purees lately though (as it’s still winter and cooked food appear more on my menu). I really like cabbage puree. Broccoli too. If I have some stray veggies, I just throw them in with the base puree as I don’t mind little bits here and there. Some people need smooth consistencies in their glops of veg slop. Not me. 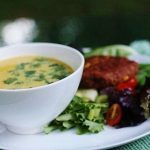 Love the addition of nutritional yeast and coconut butter, which makes this soup so unlike any I’ve ever made! This soup looks perfectly comforting! Yum! My kinda meal! What is the difference between coconut oil and coconut butter? I’ve seen the solid coconut product advertised as both. YUM! I am so making this this week! I just went a little crazy at the store and bought swiss chard, collards and kale. When I finally jammed them in my fridge I thought ‘Now what??? ?’, now I know what to do with them. Thanks as always for your inspiration! 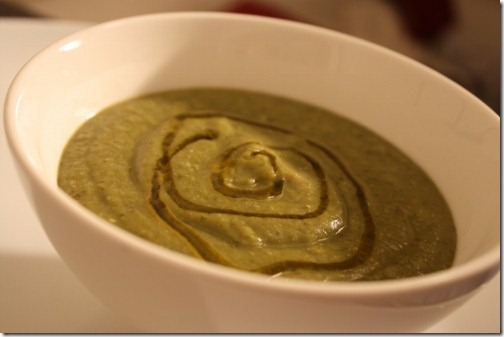 I am a huge fan of blended green soups! It was a great discovery the day i realized i could quickly blend up a huge salad into soup form and get way more greens into my body that way. This recipe is quite yumy sounding. Immediately my mind starts to think of raw ingredient substitutions. I’d probably leave out potatoes and maybe substitute sprouted mung beans or lentils for the split peas Did you use Artisana whole ground coconut butter or just coconut oil? Thanks for the recipe!! im going to start consulting m for titles of posts and meals too. hummus is my nutrient packed item of choice. as you have shown time and time again, it can be adapted and readapted so many ways and its just packed with micro and macronutrients. Thanks for the idea Gena! I had a few veggies in my fridge that needed to be used so I made my own “Wall of Green” tonight! I used onion, celery, carrots, potatoes, scallions, baby bok choi, black kale, zucchini, parsley, green split peas and organic veggie broth. I seasoned it with dried thyme and oregano, Herbamare, Mrs. Dash and pepper. It was velvety smooth and pretty tasty, but I found it was missing something. I added the juice of 1/2 a lemon at the end, and that was just the ticket to brighten up the flavours – perfect and delicious! Oh yeah – and lots of fresh garlic! I’m glad you commented on this one, Laura, because I LOVE that soup. I think I want to re-post it soon. Nice looking soup! Might I suggest you replace the carrot with a parsnip to keep the color a bit more green.